This photo was shot at the beginning of a wedding ceremony in the big, concrete bowl outside of the Washington State History Museum (WSHM) in Tacoma. 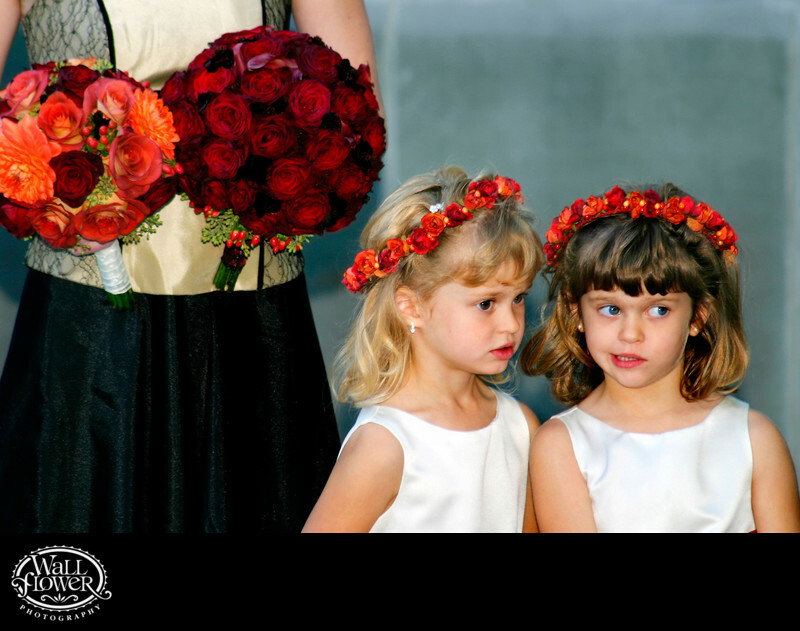 All the bridesmaids and groomsmen had processed in, followed by these two adorable flower girls, who are fraternal twins. Laura took a risk and chose to photograph them instead of the bride approaching the altar on the arm of her father, which Scott was already covering. As they watched the bride approach, one girl whispered to the other out of the corner of her mouth. Who knows what words were spoken, but everyone has fun trying to guess! To see lots of photos of weddings photographed by Wallflower Photography at this venue, visit our WSHM wedding portfolio website at www.wastatehistorymuseumwedding.com.